It goes without saying that all good mattress companies pour huge amounts of time, effort, and resources into creating a mattress that provide perfect support and comfort and is a pleasure to sleep on. But how many take your overall health into account? US company, Nest Bedding does and puts extra emphasis on building products that using organic, natural, and other non-toxic materials. It’s a great idea, and we’re all in favour of a holistic approach to well being, but how does it actually feel? Sleepopolis puts Nest Bedding’s Alexander luxury foam mattress to the test to see how it performs. Continue reading below for my full review or click here to skip to the review summary. The Nest Bedding Alexander mattress is a three layer 12″ foam mattress. 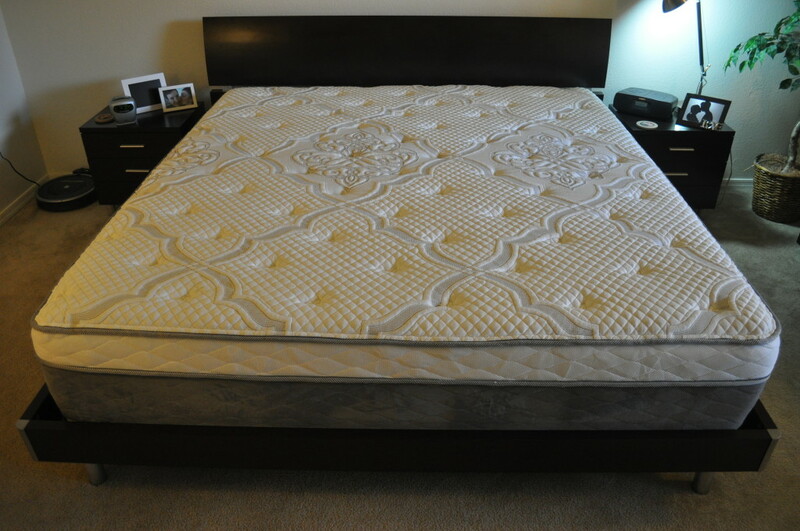 Top layer (comfort) – The top layer is 2″ of visco foam. Visco foam provides great bounce, responsiveness, and cooling. It’s an ideal layer to have on the sleeping surface of the mattress and is super comfortable. Middle layer (support and comfort) – The middle layer is 2″ of gel foam and helps to absorb heat from the sleeping surface, and disperse that through the sides and bottom of the mattress. This layer also helps to provide great support and pressure relief for the mattress. Bottom layer (foundational) – This is an 8″ layer of high-density convoluted support foam. This acts as a foundational base for the mattress. It also helps to provide deep compression support to prevent the mattress from ever feeling as if it is bottoming out. It’s built using a special manufacturing technique which builds breathable channels into the foam without destroying the integrity of the support structure. The cover is a traditional quilted piece of cotton and polyester fabric. Like the foams below, the cover is designed to be breathable, and keep the sleeping surface cool. Within the cover is 1.5″ of super soft foam, giving the mattress a lovely soft feel as soon as you lie or sit down. Aesthetically, the cover has an older style. It uses a classic floral pattern on the top piece of fabric, while the sides have more of a modern look and is built from both mesh and suede. Overall, the cover feels very well put together and quite sturdy. The stitching is tight everywhere and all of the materials choices have a quality feel to them. The Nest Alexander mattress comes in three firmness levels: soft, medium, and firm. I slept on the medium, which is about a 6 out of 10 on the firmness scale (where 10 is the most firm). The soft option is a 4 out of 10, while the firm is an 8 out of 10. When you first lie on the mattress you’re immediately struck by the soft feel of it. The quilted cover is padded with 1.5″ of super soft foam (in both the soft and medium options), which feels absolutely lovely. As you lie down, you’ll feel the support of the foam layers. In a normal lying position, there is a balanced feel to the mattress. I saw 1-1.5″ of sinkage with a slight hug and moderate body contour. The Nest Alexander mattress does not have the same deep contours that you would find in a more traditional memory foam mattress. This allows the mattress to be more responsiveness, preventing any feeling of being “stuck” in the mattress. Unlike many foam based mattresses, the Alexander sleeps fairly cool and doesn’t heat up too much during the night. 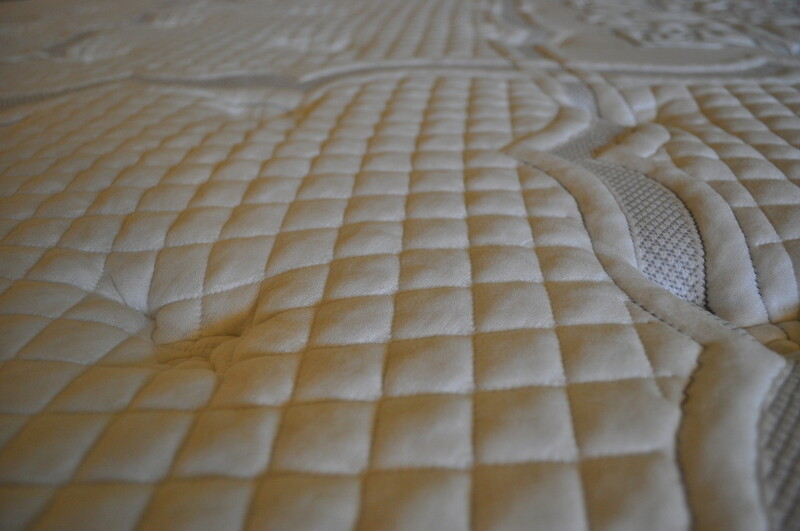 Since much of the softness comes from the quilted cover itself and not from a deep hug of foam, it allows the sleeper to sleep more on top of the foam, improving breathability. 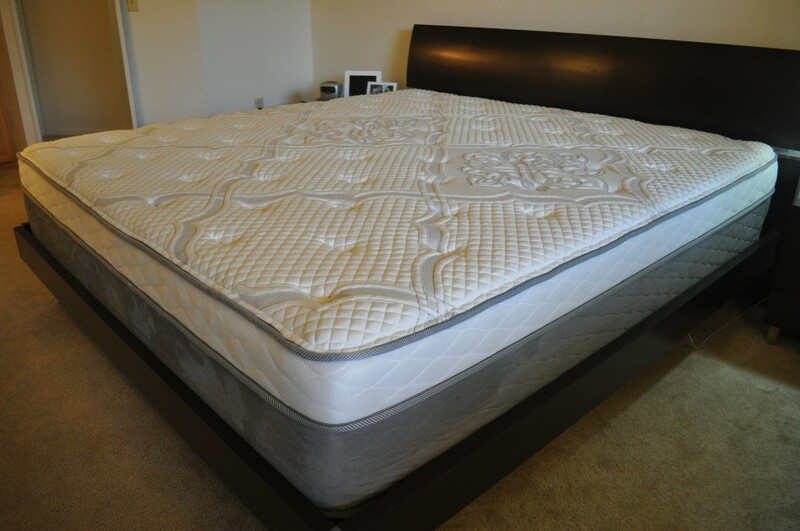 I did not feel like the Alexander mattress heated up any more than any other foam mattress I’ve tested. I was very impressed by the support provided by the Alexander (while not sacrificing anything in terms of comfort). Prior to the Alexander I reviewed the Nest Love Bed , which is a great mattress in its own right, but lacks a little something in the support department. I feel like the Alexander is a perfect step up from the Nest Love Bed – While still offering great comfort, good bounce, it has better support. VIDEO: What Alexander firmness is best for you? All mattress reviews on Sleepopolis go through a short series of basic sinkage tests. These tests are designed to give you an idea of how the mattress performs under various conditions, positions, and pressures. It can help to give you an idea of how the mattress will feel and hug around your body. Lying position – In a normal lying position where my weight was evenly distributed across the mattress I saw 1-1.5″ of sinkage. The hug is very balanced and moderate, without the excessive foam hug or sinkage that you can sometimes get with memory foam mattresses. Sitting position (conservative) – In a conservative position, where I was sitting with my bum quite far back on the mattress, I saw 2.5″ of sinkage. This edge support is about average for what I see in other comparable foam mattresses. Sitting position (aggressive) -In a more aggressive sitting position, where I was perched on the absolute edge of the mattress, I saw 4″ of sinkage. 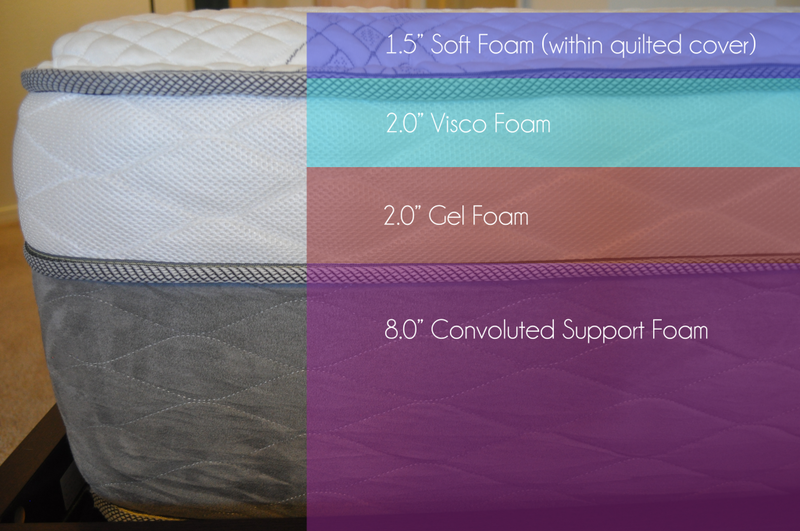 The edge support was slightly above average for comparable foam mattresses. Standing position – In a standing position, with all of my weight focused on the centre of the mattress I saw 4.5″ of sinkage. The Alexander mattress does a good job in terms of motion transfer. Like most foam mattresses, it absorbs movement so that partners do not disturb each other when changing positions, or getting into or out of bed during the night. Your sinkage and hug results will vary depending on your weight and body type. Should you buy the Nest Alexander mattress? The Nest Bedding Alexander mattress strikes a balance of comfort and support that will meet the needs of most sleepers. I especially like that the Alexander is available in three firmness levels. You want a soft, medium, or firm mattress – Nest Bedding’s Alexander mattress is one of a small number of online mattresses that is available in three different firmness levels. There are loads of medium firmness mattresses available online, so this is especially important if you are someone who prefers a firmer or softer mattress. You want a mattress with no smell – The new mattress smell can last up to a fortnight, so it’s good news that the Alexander mattress has no off-gassing period and virtually no new mattress smell at all. Nest uses more hygienic foams and manufacturing practices that eliminate the offensive odours. You want a balanced feel – The Alexander strikes a very nice balance of comfort, bounce, and support. It’s one of those mattresses that doesn’t lean too heavily in any direction, but instead hits a healthy mark in each area. For more information on the Nest Alexander mattress visit NestBedding.com. If you decide to go with the Alexander don’t forget to grab our $100 off promo code. Use code “ALEXANDER100” at check out. The Nest Bedding Alexander mattress hits a happy medium with an ideal, balanced feel in most every area. Hug, sinkage, body contouring, bounce, support, and feel are each not too much, but not too little. The quilted and padded cover give the Alexander a classic feel on top, while the foam layers provide a modern, supportive, contouring foundation. Available in three different firmness levels the Alexander is well designed to meet the needs of many sleepers.